Your experience starts with an expert complimentary design consultation. Easy to read and dimensioned space plans are then provided, allowing you to fully visualize your new space. Your custom design is then manufactured by dedicated craftsman on computerized equipment to exact specifications. Delivery and installation is then carried out by trained company installers who are committed to complete customer satisfaction. ClosetsFloor based or wall mounted. Fully adjustable shelving and hanging allows the system to change with your needs and fashions. 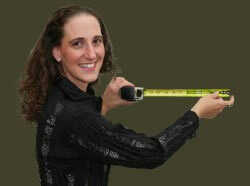 User friendly and non – gender specific systems add more value to your home at time of re- sale. From White to Walnut. From plain and simple to complex and elegant, we have what it takes to suit all of your needs and desires. Dressing Rooms Giving yourself what you deserve. This is your place to go to find everything you need. Whether for work or for play, having a place for everything and everything in its place will simplify your life. 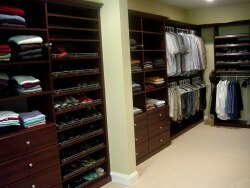 Converting existing rooms or areas into dressing rooms will make you feel great about getting ready everyday. Don't compromise - maximize. 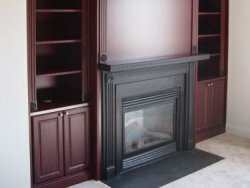 Built-InsWhether your desire is Stained Wood or Laminate, a Media Center, Book Shelves or even a Fish Tank, we can create a custom solution that will fit your life style and your budget. 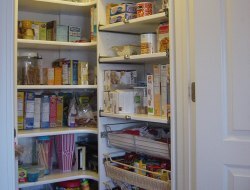 PantriesWe will create organization in your pantry like you never thought was possible. Fully adjustable radius corner shelving, pull out shelves, baskets, tray slots, hooks, and dividers all come together allowing you to not only see what you have, but be able to get to it as well. 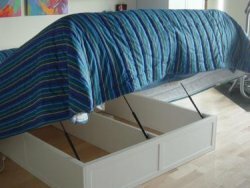 MudroomsCustom but affordable cubbies will keep your daily personal items ready and accessible. 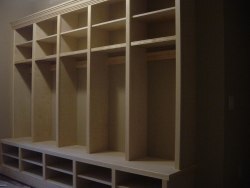 Hooks, shelving, baskets and drawers create a home for shoes, hats, keys, cell phones, backpacks and more. Imagine, coming and going just became quick and easy. Laundry RoomsEliminate the clutter that household cleaning supplies create. 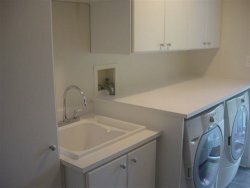 With adjustable shelving, and or cabinets, you'll be able to organize and store products in such a way that could actually make a trip to the laundry room enjoyable. 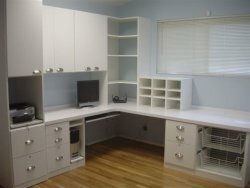 Home OfficeWhether you work from home or just need a place to sort mail, with the right balance of cabinets, drawers, files, shelving and mail slots, we make sorting and organizing easy. 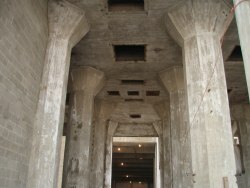 Innovative SolutionsWe provide comprehensive space plans for every storage need. Whether it's a closet, pantry, mudroom, laundry room, home office, craft room or playroom, we know how to affordably maximize its efficiency. 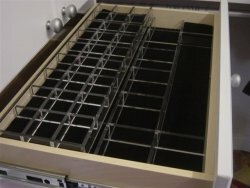 Providing you with a custom storage solution that makes organizing easy and fun. 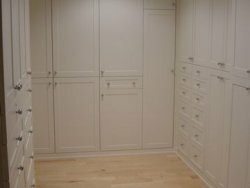 Contact UsContact us at 1-800-610-8110 to schedule your no- obligation complimentary consultation and find out why more and more people are turning to Closet Innovations to solve their storage needs.